The Agriscience program offers a comprehensive animal and plant science; agricultural mechanics; environmental science; food science; farm management; and record-keeping program that is laboratory based using a hands-on approach. The program prepares students for agricultural, biological, scientific, laboratory, and post-secondary pursuits. The content area includes Introduction to Agricultural Sciences, Animal Sciences, Plant Sciences, Horticulture, FFA and Leadership; Supervised Agricultural Experiences, Agricultural Mechanics, Food Science, Environmental Sciences, Aquaculture, Farm Management, and Record Keeping. 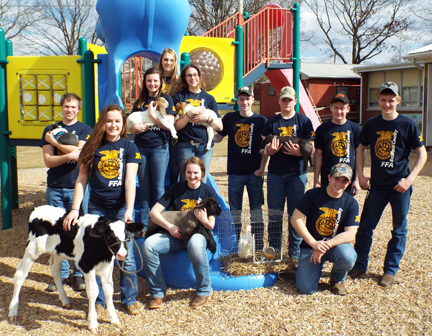 BCTC houses an active chapter of the National FFA Organization and is an integral part of building leadership personal growth, and career success for students in the program. The FFA organization also provides an opportunity for skills competitions, and emphasizes public speaking, debate, and demonstration of agriscience career proficiency.This course helps students understand the important role agriculture serves as the agriscience industry moves into the future. National Occupational Competency Testing with advanced certification is administered upon completion of the course. One to three years (Grades 10, 11, and 12) depending on the student’s interest and career goals. The Agriscience program incorporates high academic standards that will help prepare students for post-secondary opportunities. Examples of post-secondary institutions are Penn State University, University of Delaware, and Allegany College of Maryland.